Police recovered a man's body from the Hudson River near the George Washington Bridge on Nov. 23, 2013. WASHINGTON HEIGHTS — A man's body was pulled out of the Hudson River on Saturday afternoon, and police were investigating the incident. 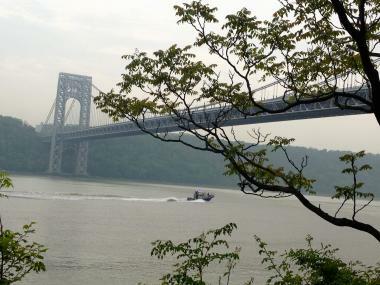 The NYPD responded to a 911 call from a witness who spotted the body at around 2:45 p.m. after it had washed up near rocks about a quarter of a mile north of the George Washington Bridge, police said. Police were preparing to move the body for further investigation to a nearby dock, an NYPD spokesman said. The identity of the man was not immediately known, nor was any information leading to the circumstances of his death, police said.